Our landscape design staff takes a hands-on approach to provide you with “Before & After” landscape renderings, so you can see just how beautiful your property can look. With this technology, you can tell us exactly what you want to see, or have or designers create a one-of-a-kind landscape made just for your property. 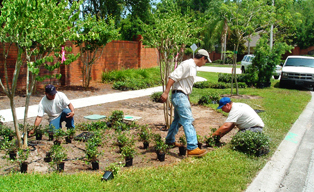 Our Landscape Installation crews are available for major and minor tree/shrub installations, property renovations, and virtually every type of landscape enhancement service to enhance the beauty of your property. Let our award-winning team show you how spectacular your property can be!